Well, that is the end of one of the most surreal Mondays of my life. It seems that all the mental imagery I conjured up during every hard training session over the last year played out for real this weekend. Either that or I'm still dreaming. Whichever it is, it feels pretty awesome. Karapoti is a special race. In fact, it's more than just a race. 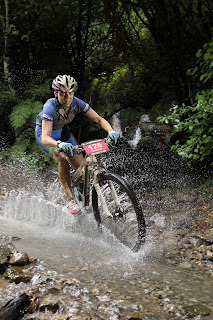 It's a an iconic piece of kiwi mountain biking history, a stripped back brutal no holds barred course left pretty much au naturale, and a huge challenge whatever part of the elite to weekend warrior spectrum you sit on. It also holds a place dear to my heart, being my home town race. For all those reasons, I totally love it. Everyone has their own goals going in to Karapoti. Surviving. Completing. Joining the "sub 3" club. Setting a new PB. That's kinda the order things worked out for me. I actually have four Karapoti finishes to my name. My first was a baptism of fire so please add experiencing the infamous Karapoti induced mechanical failure to the list too. My lesser known first 'poti was actually a bit of a disaster. It was in 2010 just a few months after moving to New Zealand. Despite a great start, I punctured on the Rock Garden then underestimated the distance to the bottom of Devil's Staircase and elected to ride on the rim then fix it at the top of the infamous hike-a-bike section. At the time it seemed like a very logical place to opt to sit down for a little rest and fix a puncture. 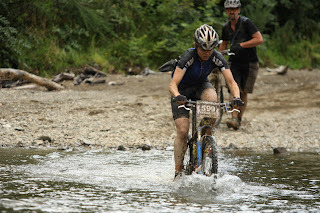 Unfortunately, I suffered several punctures subsequently (probably due to minor *cough cough* wheel damage quite possibly sustained from riding on the rim) and at one stage sat at the side of the track trying to glue multiple patches to a tube. After yet another deflating moment, I gave up on my trailside repair efforts and embarked on a run from Doper's back down the gorge to finish in 4 hours 25 minutes. It was a nightmare. I almost wanted to do it all again the next day just so I could see what I could do with better luck. Almost. Instead, I took the more sensible option (unusual decision for me) and waited until the 2011 edition. For the first time, women had a mass start with elite and expert age graders setting off together. 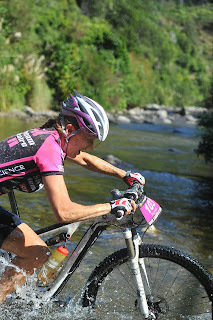 I surprised most of the elite field, as well as myself, with a new M1 women's course record of 3 hours 10 minutes and a second place finish overall behind multisport ace, Elina Ussher. 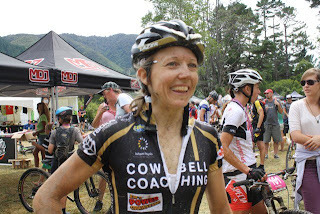 Four months before 'poti 2012, I'd made the plunge back into structured training under the watchful guidance of Cowbell Coach, Lisa Morgan. Spurred on by the coach's suggestion (she was actually quite adamant) that a sub 3 hour time was possible, I cracked out a 2:59:59 and a second place finish behind Karapoti sub 3 hour club regular, Fiona MacDermid. I still remember taking my first look at the Karapoti Hall of Fame. It's an impressive who's who list of mountain biking history and something I already felt totally humbled to have become part of. The women's sub 3 hour club is even more exclusive and 2012 was a special effort to get myself into that club. I had never felt so emotional at the end of a race as after that 20-something minute on the rivet effort from the top of Dopers back to the finish line never quite sure if I'd make it or not but never backing off just in case it was possible that I could. One hundredth of a second was all that was in it in the end! 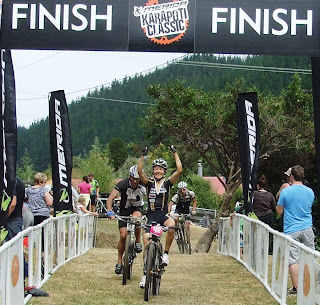 After two consecutive runner-up positions, I was pretty sure I could take the next step up on the "right" year (which for Karapoti inevitably means the right mix of conditions and right amount of luck in addition to the right amount of hard work beforehand) but I was never quite sure when it would be. I have to say that the addition of Karen Hanlen's name on the 2013 startlist made me contemplate that this may not quite be the "right" year for me! 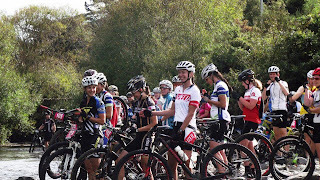 She is a formidable athlete with incredible strength, awesome attitude and an ability to ride herself back into a race like no one else I have ever seen before. Having Karen as an opponent was always going to inspire some fast riding and I was in PB form going into the race at the very least. Karapoti 2013 was certainly not a flawlessly executed ride. 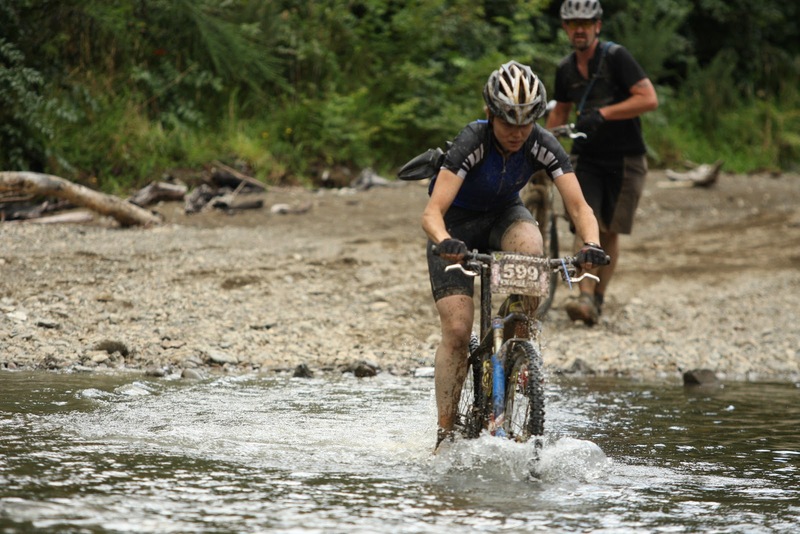 I snapped my bottle cage while shouldering the bike on an early section of congested climbing and a long dry summer left the descents super loose ending in some blood letting on Rock Garden and a high speed spill on Pram Track. Somehow, I choreographed a crash-roll-grab bike-remount sequence on my Pram Track crash without ever fully grinding to a halt. The key is to keep momentum going at all times (LOL). 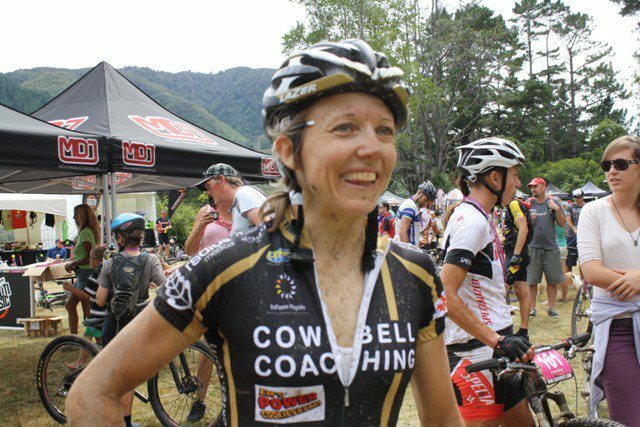 Despite those minor setbacks, I set a fast time of 2 hours 50 minutes, smashed out a PB, became the fourth fastest female in the history of Karapoti and came home as the first ever Upper Hutt resident to win. Totally stoked (words don't do it justice but you get the gist). I'm sure there'll be many, many, many more Karapotis (or Karapotii?) in my future with grand stories to tell from each of them. I have a feeling it will probably become a lifelong obsession. After all, for some of us, anything after the first weekend in March is just the start of the countdown to the next Karapoti. But for now, my more immediate goals include celebratory drinks (mugs of tea count too) and sleep. It may be some time before this smile wears off. Huge thanks to my awesome sponsors who have helped me ride faster every year - you guys are the best! A totally deserved win Kim, and an excellent writeup. Bring on the Highlander and the BC race!!! !